He is talking about exhibit design on a quite general level though. The Ear and The Scream Measurer, Experimentarium, Copenhagen. The Experimentarium in Copenhagen is in many ways outstanding. I really enjoy visiting the place, bringing along children and see them play. This photo shows two installations in the main exhibition, in the subarea You and me (In Danish: Dig og mig). Read about the Ear-installation at the web site of the science centre. The Scream installation is fun – Scream ALL you can into the mouth of the lion (roar like a lion) and the volume of your scream/roar will be measured on the palm tree (shown with red lamps lighning up the scale on the trunk). Of course the children love this. The special attraction of this installation is, I think, the encouragement that is given to actually scream all you can. I had to try some times before I managed to do it. The space ‘inside’ the lion swallow up a the sound so that it doesn’t disturb other visitiors at the place. So you get a semi-private and very bodily experience of your screaming capacity. Hvor højt kan du brøle? Stik hovedet ind i løvens gab og skrig. 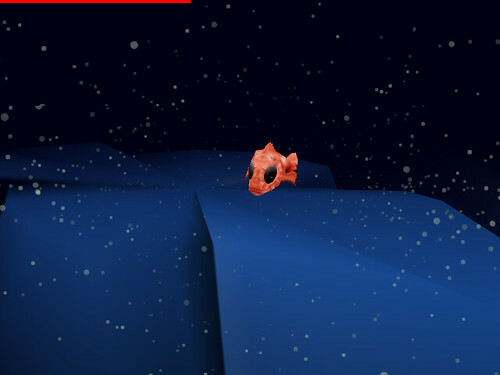 The goal was to develop a digital game that integrate knowledge on the deep sea in order to reach, engage and inspire children on the subject through game play. MARA is developed by a multidisciplinary working group collaborating with Bergen Museum and the international deep sea research prosject Mar-Eco. 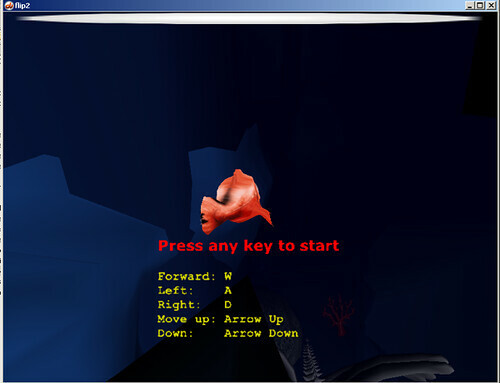 The goal is to develop a game (to function in a deep sea exhibition and on the web) that inspire children and might lead to them wanting to know more about the life at the deep sea. The development of a learning game concept is part of my ongoing exploration of games with pedagogical aims. 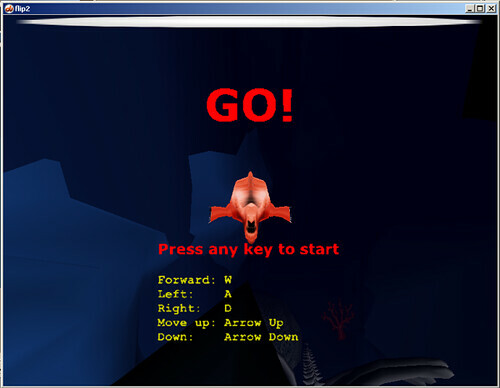 I am interested in how games can be exploited in pedagogical contexts. The development of phase 1 and 2 of the project is supported by Bergen Museum and Meltzerfondet. Installations, games, physical and digital. I just posted some pictures (January 9th. 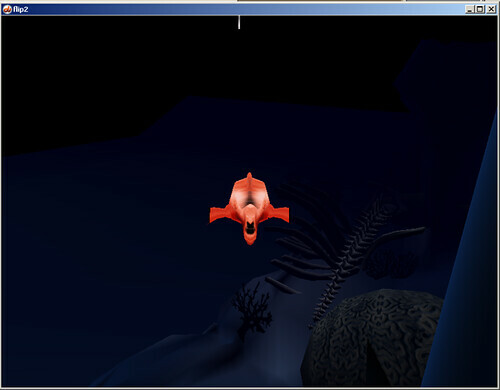 2008) from the ongoing process of making a digital game prototype for web and museum installation (play the fish Mara (she’s a Orange Roughy) in the deep sea). 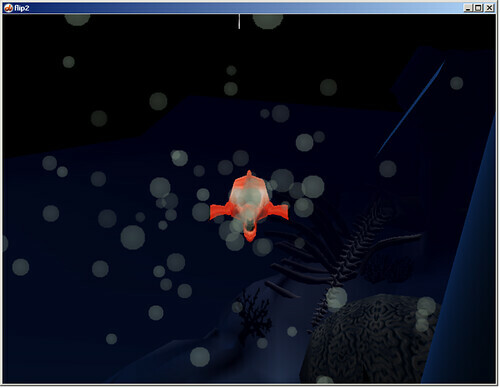 See the pictures and more information here: Mara game development / prototype phase 2a. I am looking forward to wrap up the development phase 2a during february and go on to the next phase of the project. By the way, in the actual game Mara is moving her body when swimming, not being stiff as in the slideshow to the left :-) and the white dots are moving. This is maritime snow that can be eaten in order to gain more energy to swim. MARA utvikles av en flerfaglig arbeidsgruppe som samarbeider med Bergen Museum og det internasjonale dyphavsforsknings-prosjektet Mar-Eco. Målet med Mara spillet er å inspirere barn/ungdom i forhold til livet på dyphavet. Utviklingen av konseptet er en del av min undersøkelse av spill med pedagogiske mål. Jeg er opptatt av hvordan spill kan utnyttes i læringssammenhenger. Utviklingen av forprosjektet er støttet av Bergen Museum og Meltzerfondet. Utvikling av fase 2 i prosjektet er støttet av Meltzerfondet. Seal healing concept was part of the performance project Probe (Sonde) in Artgenda 2002 Hamburg. Performative interventions included preparation of whalebeef tasters, silent speeches and healing performances – all in outdoor public. A specialy designed dress in seal fur makes up the seal healer. “A probe is a space shuttle for the investigation of alien areas. A probe is a medical instrument for diagnosis and local therapy. The space shuttle of the artist collective PROBE will land in the context of ArtGenda in Hamburg on the Spitalerstrasse. From the13th to the 20th of June 02 the probe will be the base station and the strategical center for 20 national and international artists. Thereby the individual artists regard themselves as humanoide probes and diagnose what the environment is missing. After the diagnostic phase they involve themselves artistically in order to show further possibilities how to behave in a german city-center. Therefore they regard themselves as a part at the ohter users of public space but also as a co-creater of it. The goal of that is to find out and extend the scope of action and creation in public space.” (information from www.artgenda.com, 2002). Seal healing concept was part of the performance project Probe (Sonde in german) in Artgenda 2002 Hamburg. Performative interventions included preparation of whalebeef tasters, silent speeches and healing performances – all in outdoor public. The dress is designed and crafted by designer Katrine Nylund, Bergen. Seal healing photos are shot by SANNA, Hamburg 2002. Seal healing is supported by The municipality of Bergen, Norway 2001/2002. Archive (Page moved to post). Specifications: Video installation. video 6 minuts long, looped. Projection in window, outdoor. Hiv geography was shown with Trust Your Local Artist at Artgenda 2002 Hamburg (TA Artgenda). A video installation that put focus on the HIV/Aids pandemic in the south of Africa. Many children are victims of the pandemic directly in the form of getting infected and indirectly through loss of parental care. Video projection in container window. The video content is sensual images of bathing children in slowmotion and fragments of a womans voice telling her story about becoming and being hiv positive – creating an uncanny atmosphere. The video was projected through a work-container window. “The Hein-Koellisch-Platz, formerly a lively market place, is today a center of multi-ethnic activity and social co-existence. It is situated between the famous Hamburg Fish Market and the legendary Reeperbahn, north of the harbor. The square is surrounded by numerous street cafes, bars and restaurants, as well as some of the city’s finest music clubs. This central square in Hamburg St.Pauli will be the exhibition site for videos and computer animated art, which will be projected onto the square through the windows of the studio within. The windows will be illuminated like a light box and will serve as a display screen.” (info from www.artgenda.com, 2002). Specifikationer: Video installation. video på 6 minutter, loopet. Projection i vindue, uderum. Hiv geography blev vist med Trust Your Local Artist i Artgenda 2002 Hamburg (TA Artgenda). Hiv geography sætter fokus på HIV/Aids epidemien i det sydlige Afrika som rammer barn svært hardt både direkte i from af smitte og indirekte i form af forældreløshed. Videoen består av sanselige billeder af badende afrikanske barn i slowmotion samt fragmenter af en kvindes urovækkende historie om at være hiv positiv på lydsiden. Video projiceres gennem vinduet for enden af en container der står lidt afsides i forhold til de andre værker i TA Artgenda. Dette korresponderer med emnets utkant/’outskirt’ prioritet, når det gælder politisk handle-villighed, samt med de sorte townships tvangsmessige placering udenfor de hvide bykerner i Sydafrika. Containeren overgår i kvalitet mange township boliger. I am looking forward to wrap up the development phase 2a during february and go on to the next phase of the project. 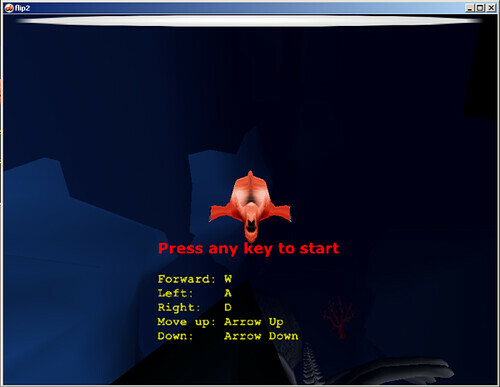 The first playable prototype (project development phase 2a), for further testing, will be ready in the end of february 2008. 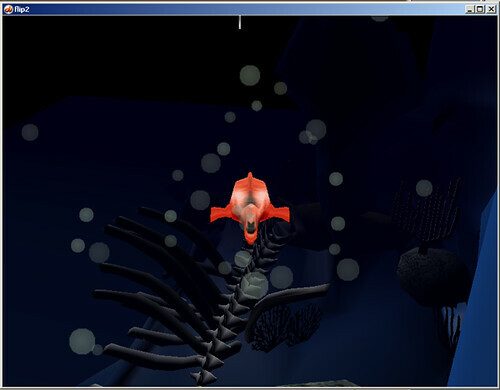 The goal is to develop a digital game that integrate knowledge on the deep sea in order to reach, engage and inspire children on the subject through game play.